Roger Patterson and Bob Gimlin had their encounter with Bigfoot on October 20, 1967. The Patterson-Gimlin (PG) film used a 16mm Kodak Cine 100 camera. Only 59.5 seconds long, it remains as one of the strongest pieces of evidence for the existence of Sasquatches to this day. The footage was filmed alongside Bluff Creek, a tributary of the Klamath River, about 25 logging-road miles northwest of Orleans, California, in Humboldt County. The film site is roughly 38 miles south of Oregon and 18 miles east of the Pacific Ocean. For decades, the exact location of the site was lost, primarily because of re-growth of foliage in the streambed after the flood of 1964. It was rediscovered in 2011. It is just south of a north-running segment of the creek informally known as "the bowling alley". Patterson died of cancer in 1972 and "maintained right to the end that the creature on the film was real". Patterson's friend, Gimlin, has always denied being involved in any part of a hoax with Patterson. Gimlin mostly avoided publicly discussing the subject from at least the early 1970s until about 2005 (except for three appearances), when he began giving interviews and appearing at Bigfoot conferences. Nearly 50 years later, Bob Gimlin told Outside magazine that he wishes he'd never left his home in Oregon to go searching for Bigfoot with Patterson. "They'd come driving in my driveway all times of the night and go ‘Bob! We want to go out Bigfoot hunting!’" he said. "I can understand why they don't believe in it — because I didn't believe it either. But I saw one. And I know what I saw. And I know it wasn't a man in a suit. It couldn't have been!" The Discovery Channel talks about the Patterson–Gimlin Bigfoot sighting and footage. As their stories went, in the early afternoon of Friday, October 20, 1967, Patterson and Gimlin were riding generally northeast (upstream) on horseback along the east bank of Bluff Creek. At sometime between 1:15 and 1:40 PM they "came to an overturned tree with a large root system at a turn in the creek, almost as high as a room". When they rounded it, "there was a logjam—a 'crow's nest'—left over from the flood of '64," and then they spotted the figure behind it nearly simultaneously. It was either "crouching beside the creek to their left" or "standing" there, on the opposite bank. Gimlin later described himself as in a mild state of shock after first seeing the figure. Patterson initially estimated its height at six and one-half to seven feet, and later raised his estimate to about seven and one-half feet. Some later analysts, anthropologist Grover Krantz among them, have suggested Patterson's later estimate was about one foot too tall. Gimlin's estimate was six feet even. The film shows what Patterson and Gimlin claimed was a large, hairy, bipedal, apelike figure with short, "silvery brown" or "dark reddish-brown" or "black" hair covering most of its body, including its prominent breasts. 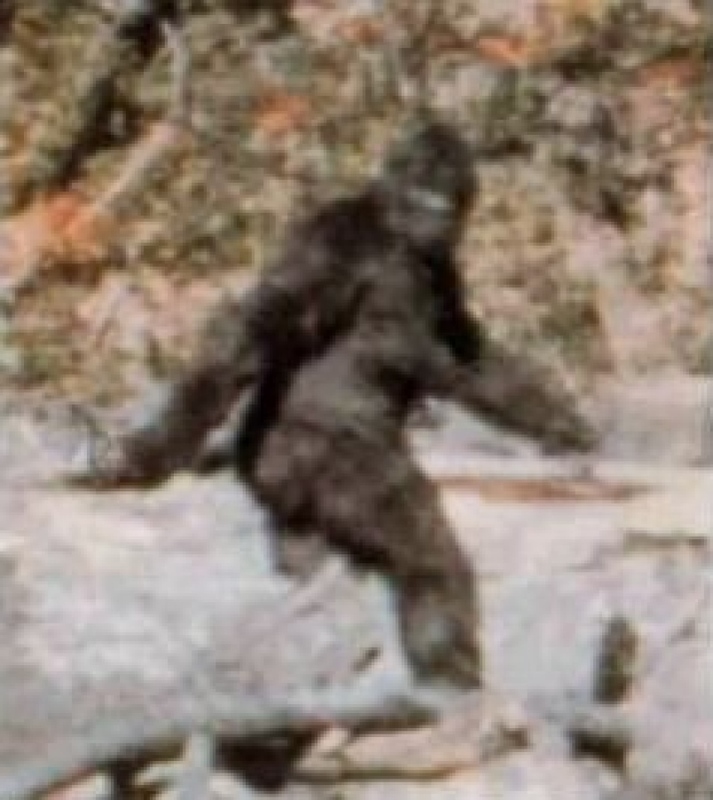 The figure in the Patterson–Gimlin film generally matches the descriptions of Bigfoot offered by others who claim to have seen one. Patterson estimated he was about 25 ft (7.6 m) away from the creature at his closest. Patterson said that his horse reared upon sensing the figure, and he spent about twenty seconds extricating himself from the saddle, controlling his horse, getting around to its other side, and getting his camera from a saddlebag before he could run toward the figure while operating his camera. He yelled "Cover me" to Gimlin, "meaning to get the gun out". He crossed the creek on horseback after Patterson had run well beyond it, riding on a path somewhat to the left of Patterson's and somewhat beyond his position. Perez estimates he came within 60–90 feet of "Patty". Then, rifle in hand, he dismounted, but did not point his rifle at the creature. The figure had walked away from them to a distance of about 120 ft (36.5 m) before Patterson began to run after it. The resulting film (about 59.5 seconds long at 16 fps) is initially quite shaky until Patterson got about 80 ft (24.4 m) from the figure. At that point, the figure glanced over its right shoulder at the men and Patterson fell to his knees; on Krantz's map this corresponds to frame 264. To researcher John Green, Patterson would later characterize the creature's expression as one of "contempt and disgust...you know how it is when the umpire tells you 'one more word and you're out of the game.' That's the way it felt." Frame 352 of the film, alleged to depict a female Bigfoot, known informally as "Patty," looking back at Patterson and Gimlin. Shortly after this point the steady, middle portion of the film begins, containing the famous look-back frame 352. Patterson said, "it turned a total of I think three times," the other times therefore being before the filming began and/or while he was running with his finger off the trigger. Shortly after glancing over its shoulder on film, the creature disappeared behind a grove of trees for 14 seconds, then reappeared in the film's final 15 seconds after Patterson moved ten feet to a better vantage point, fading into the trees again and being lost to view at a distance of 265 feet as the reel of film ran out. Gimlin remounted and followed it on horseback, keeping his distance, until it disappeared around a bend in the road three hundred yards away. Patterson called him back at that point, feeling vulnerable on foot without a rifle, because he feared the creature's mate might approach. The entire encounter had lasted less than two minutes. Next, Gimlin and Patterson rounded up Patterson's horses, which had run off in the opposite direction, downstream, before the filming began. Patterson got his second roll of film from his saddlebag and filmed the tracks. Then the men tracked "Patty" for either one mile or three miles (5 km), but "lost it in the heavy undergrowth". They went to their campsite three miles south, picked up plaster, returned to the initial site, measured the creature's step-length, and made two plaster casts, one each of the best-quality right and left prints. At approximately 6:30 PM, Patterson and Gimlin met up with Al Hodgson at his variety store in Willow Creek, approximately 54.3 miles south by road, about 28.8 miles by Bluff Creek Road from their camp to the 1967 roadhead by Bluff Creek, and 25.5 miles down California State Route 96 to Willow Creek. Patterson intended to drive on to Eureka to ship his film. Either at that time, or when he arrived in the Eureka/Arcata area, he called Al DeAtley (his brother-in-law in Yakima) and told him to expect the film he was shipping. He requested Hodgson to call Donald Abbott, whom Grover Krantz described as "the only scientist of any stature to have demonstrated any serious interest in the (Bigfoot) subject," hoping he would help them search for the creature by bringing a tracking dog. Hodgson called, but Abbott declined. Krantz argued that this call the same day of the encounter is evidence against a hoax, at least on Patterson's part. After shipping the film, they headed back toward their camp, where they had left their horses. On their way they "stopped at the Lower Trinity Ranger Station, as planned, arriving about 9:00 p.m. Here they met with Syl McCoy (another friend) and Al Hodgson." At this point Patterson called the daily Times-Standard newspaper in Eureka and related his story. They arrived back at their campsite at about midnight. At either 5 or 5:30 the next morning, after it started to rain heavily, Gimlin returned to the filmsite from the camp and covered the other prints with bark to protect them. The cardboard boxes he had been given by Al Hodgson for this purpose and had left outside were so soggy they were useless, so he left them. When he returned to the camp he and Patterson aborted their plan to remain looking for more evidence and departed for home, fearing the rain would wash out their exit. After attempting to go out along "the low road"—Bluff Creek Road—and finding it blocked by a mudslide, they went instead up the steep Onion Mountain Road, off whose shoulder their truck slipped; extracting it required the (unauthorized) borrowing of a nearby front-end loader. The drive home from their campsite covered about 580 miles, the initial 28.8 miles on a low-speed logging road, and then about 110 miles on twisty Route 96. Driving a truck with three horses, and allowing for occasional stops, it would have taken 13 hours to get home Saturday evening, at an average speed of 45 mph; it would have taken 14.5 hours at a 40 mph average speed. US Forest Service "Timber Management Assistant" Lyle Laverty said, "I (and his team of three, in a Jeep) passed the site on either Thursday the 19th or Friday the 20th" and noticed no tracks. After reading the news of Patterson's encounter on their weekend break, Laverty and his team returned to the site on Monday, the 23rd, and made six photos of the tracks. Taxidermist and outdoorsman Robert Titmus went to the site with his sister and brother-in-law nine days later. Titmus made plaster casts of ten successive prints of the creature and, as best he could, plotted Patterson's and the creature's movements on a map.